To plant an apple seed, first you should understand the steps needed to produce an apple tree from seed. 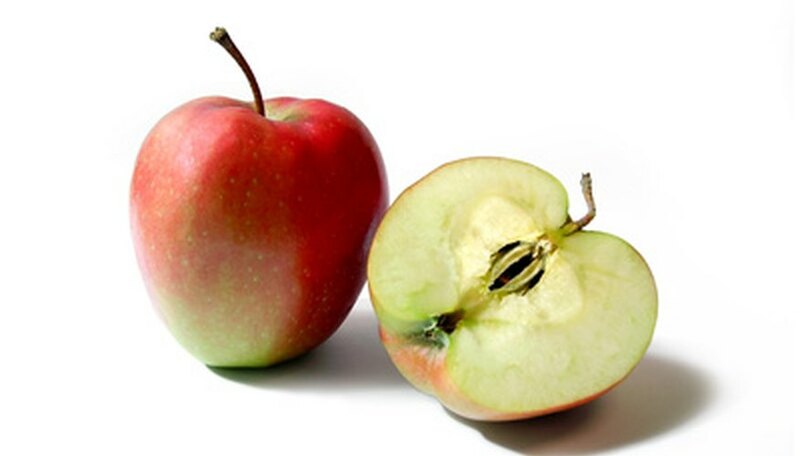 Apple trees take an average of four years before producing the first apples. Fill the bowl halfway with water. Set the bowl aside. Pick a ripe apple to make sure the seeds are easy to pull out--you don't want the seeds sticking to the fruit. Cut the apple in half lengthwise with the knife. Pick the seeds out of the apple and put them in the bowl of water. Allow the bowl of water to stand overnight. Drain the water slowly into a strainer the next morning. Set the bowl aside. Set a paper towel on the counter. Dump the seeds onto the paper towel. Fold the paper towel over the seeds and pat the seeds dry. Fill the plastic cup halfway with the potting soil. Poke a finger-size hole into the center of the soil. Put an apple seed into the middle of the hole and cover it over with the soil. Dampen the soil until it gets moist but not drenched. Repeat this step for each apple seed you want to plant. Place each seed-filled cup in the refrigerator along the side wall of one shelf. Keep the cups away from the back corners of the shelf because the seeds will freeze and never germinate. This is because the back corner is too cold; seeds require a temperature between 35 to 40 degrees to germinate. Allow the apple seeds three months to germinate. Check for root growth every 30 days, looking for small white roots against the sides of the cups. Move the cups to a window with direct sunlight once roots have appeared. Maintain a median temperature of 70 degrees for the roots by keeping them in direct sunlight until seedlings appear. Water the seedlings, keeping the soil damp but not wet. Once the seedlings appear, it is time to move the plants to their permanent location. Cut a milk carton in half width-wise with the knife. The bottom of the carton will make a small biodegradable box for planting. Fill the bottom of the carton with potting soil to the lip. Dig a small hole in the center of the soil with the spoon. Make the hole large enough to place most of the soil and seedling from the cup into the carton. Repeat this step for each seedling. Discard the top of the milk cartons. Set the carton planters back in the windows. Let the seedlings grow to 3 inches high. Keep the seedlings inside until you are ready to plant them in the ground. Pick a permanent location for the apple trees. Choose a spot that gets full sunlight at least half of the day. Clear out the area of any weeds that would compete with the seedlings for nutrients. Set a milk carton on the ground. Dig an outline around the carton 1 inch in diameter larger than the carton planter. Move the carton and dig a hole one inch larger in depth than the carton. This gives plenty of room for the seedling to fit into the hole. Cut off the sides of the carton from the soil and seedling. Grasp the seedling gently by the base and place it into the hole with the dirt. Cover the roots of the seedling with dirt and tamp the dirt down gently. Water the seedling until the dirt is damp.